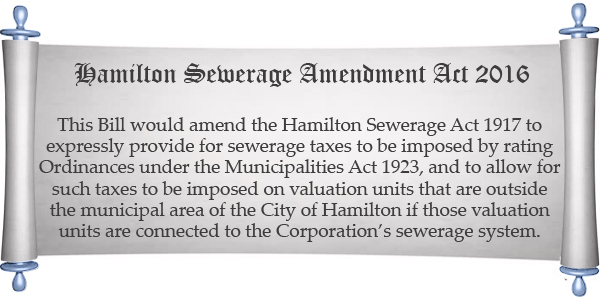 The Hamilton Sewerage Amendment Bill was brought before the House of Assembly, with the Bill seeking to allow sewerage taxes to be imposed on units that outside the municipal area of the City of Hamilton if the units are connected to the Corporation’s sewerage system. Speaking outside the House on Friday, Economic Development Minister Dr Grant Gibbons told Bernews, “Going back a number of years, the Corporation of Hamilton recognized that they needed to start putting some money aside for capital upgrades to the sewage system, which, as everybody knows, deals with everybody within the municipal boundaries, but they’re also a lot of others that are connected up. “It goes as far as Berkeley, CedarBridge, Prospect, and a lot of Government facilities as well. It goes all the way out to the east through East Broadway, and the hospital’s connected to it as well. “We’re talking about a fairly major infrastructure system here. They’ve done some capital upgrades in the last couple of years, but they recognize they need to start putting some money aside for that. “The Bill this morning essentially gave them the authority to be able to impose, under an old ordinance, an old Act in the city of Hamilton, the 1917 act, a sewage tax simply for capital upgrades. The tax is likely to be very modest, the maximum they can assess is some $0.25 per hundred dollars,” continued Dr Gibbons. “For a small residential ARV of about $30,000, that looks like it’s going to be about $75 per year. Larger property maybe up to $250, that would be the maximum. “There was also some discussion about the need to look at how we deal with raw sewage, which is now pumped out off of Seabright and through rather a long pipe out there. “I think the discussion revolved around the fact that depending on the amount of treatment, that could range from $20 to $60 million dollars in additional capital spending. No problem with this move. CoH have every right to tax residences and businesses that fall outside of their formal governing boundary, specifically with regards to their use of CoH infrastructure. The need to plan and fund infrastructure upgrades and maintenance is vital. They are too busy paving over all the parking bays, narrowing the roads and putting in an acre of paving stones from Tills Hill to Tools and Equipment, amongst other follies, to build a sewage treatment plant. Oh yeah, we need 8000 more people to increase the flow into our waters too. We are going to need a TEA party as our next political party when the government has to resort to taxing sh*t. Looks like they are running out of eligible items to tax. Look out civil service. this is the COH…are you without more than just George? Man, if they could tax the amount of BS coming out of Alaska Hall the debt could be paid in a month. If a problem such as a break in the sewer line were to occur say at East Broadway the only option would be to pump raw sewage into Hamilton Harbour. There is no holding tank. The “treatment” tank across from the Supermart is very large but almost always full. There is no alternative and the pumping into the Harbour would start within minutes. If you read the bill and not the headline you will see both inside and outside valuation units will be charged this new tax . The rates and current connection charges are used for maintenance of the system according to what Gibbons said on Friday. Almost three quarters of a million for operations this year according to 2016 budget. The only real choice for Hamilton sewage is to pump to the Blaackwatch Pass area. There to be properly treated before discharge into the waters of the North Shore. Possibly with a backup plan to also use the existing sewage line that discharges off shore at Hungrey Bay. On the other hand if the sewage is properly treated it could be discharged into Mills Creek. … Not if they are still dumping it out at Seabright untreated ! Treated bullsh*t means more money thrown at it versus untreated bullsh*t meaning less money thrown at it! No money…more sh*t! !